Lush Fab Glam Inspired Lifestyle For The Modern Woman: Spruce Up Your Outdoor Space With These Fab And Budget Friendly Decor Themes. 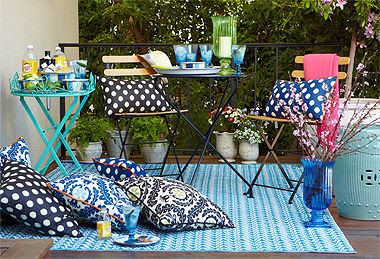 Spruce Up Your Outdoor Space With These Fab And Budget Friendly Decor Themes. The spring and summer seasons are the perfect time for hosting outdoor garden and pool parties or more formal celebrations like bridal showers and alfresco dinning events. Read on to see creative and budget friendly ideas for decorating your outdoor space in beautiful design themes like Fuchsia Party, Nautical/Pool Blues, Tropical Forest Green, Yellow Flower Garden and Elegant Black and Crystal. All featured items retail for under $100 and are part of One Kings Lane outdoor entertaining sale being held this weekend only. Plus you can Sign up today for a $15 credit for purchases of $30 or more. 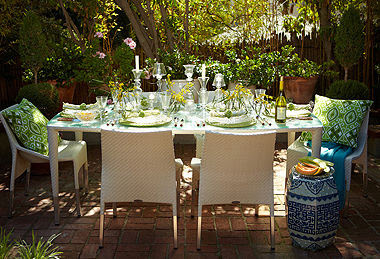 Click to shop One Kings Lane Williams-Sonoma Entertaining: Outdoor book. Visit One Kings Lane to shop the items featured above during their weekend only outdoor entertaining sale. Which outdoor entertaining theme is your favorite? Leave a comment below. Love the greens and pink.